The American University of Bahrain (AUBH), the first purpose-built American university in the kingdom, will open its doors in September. The university promises a fresh new approach in programme delivery, and significantly changing the landscape of higher education in the country. 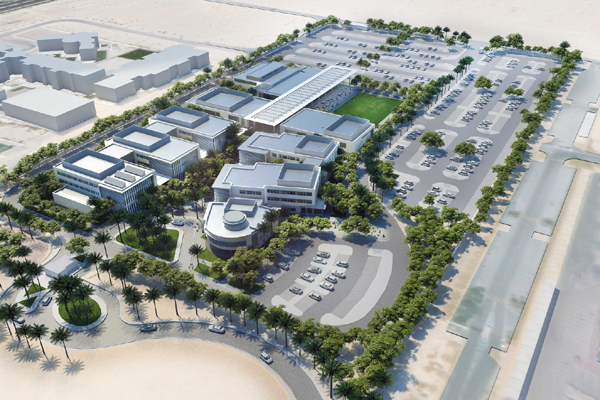 Built on a 75,000-sq-m plot in the prestigious Riffa area, the AUBH campus is designed by the US-based global architects Ayers Saint Gross (ASG), who have designed a number of renowned US university campuses. The new AUBH campus will feature modern classrooms and labs, as well as a state-of-the-art auditorium, student commons, and athletic facilities, all of which will encourage and foster interaction and collaboration between students, faculty and the professional community, providing an educational experience unique to the Middle East. Strong emphasis on graduate outcomes and employability will be key differentiators of the new university which aims to offer world-class higher education opportunities in a rapidly evolving Bahrain and the wider Middle East region. The AUBH Board proudly selected Dr Susan E Saxton, an internationally experienced executive to lead AUBH as founding President. Dr Saxton is recognised for building business capability and transforming institutions into operational success stories. Influenced heavily by achievements in competitive athletics, Dr Saxton’s leadership, self-discipline, rigor, and focus were consolidated early in her career and played a key role in her rise to that of an upper echelon internationally recognised senior executive uniquely experienced and credentialed in both business and academia. “Higher education plays an integral part in advancing economies by addressing the skills needed for the next generation of workforce. The American University of Bahrain will provide the necessary academia to support the Kingdom’s 2030 vision while enriching students with a holistic university experience,” she said. “Beyond the academic education that the students will receive, they will receive mentorship in soft skills and competencies including problem solving, negotiation and creative thinking with the purpose of empowering the next generation with the confidence, leadership and professionalism skills required in the workforce. They will also be able to experience social, athletic and other extra-curricular activities making AUBH home,” she added. Prior to joining AUBH, Dr Saxton was the chief executive officer, Int. and senior vice president innovation and emerging strategies for the University of St Augustine, a Laureate Education institution; chief strategy and development officer for the International Baccalaureate Organization in The Hague; and chief strategy officer, chief academic officer, and senior vice president for Laureate Education Inc. Global Products and Services Division. Dr Saxton holds two PhD’s in business and human services, as well as a Master of Laws (LLM) from the University of Liverpool in the UK, Masters of Science in Business Administration (MSBA) and Boston University and a BA from Wellesley College in the US.